This smart Mason Jar makes a beautiful wall hanging! Now easily paint or decoupage it to make the most beautiful gifts for yourselves and your family and friends! We offer Mason Jar to our clients. - FUN DESIGNS: Forget about the boring old mason jars. This jar is very original and stylish and will give a spark to your everyday table and your cocktail parties. 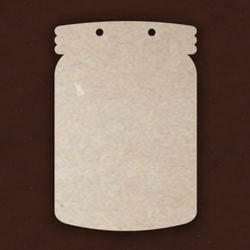 Banking on our enriched industry experience, we are able to supply Mason Jar. - It's also double wall insulated to reduce condensation. - Comfortable to the touch, even full of icy-cold sweet tea. We offer Glass Canning Jars. - Price may vary between Rs.15-24 depanding on size of the Canning Jars. Canning is a method of preserving food in which the food is processed and sealed in an airtight container. The process was first developed as a French military discovery. The recipes using canned ingredients are similar in nutritional and taste value to those made with fresh or frozen items. We are a top-notch organization, engaged in providing Mason Jar. Perfect serving cup for blended drinks, smoothies and other cold beverages. 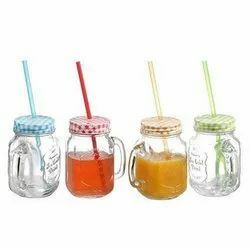 Glass Mason Jar Beverage Cups with Chevron Pattern metal lids & straws. Ideal for wedding, bar, household, party, or any social gathering. Great gift idea for friends and family. these glasses will be at the heart of every house, barbeque and garden party. The actual cost of product is Rs 25 we are selling for 12 because we are shutting down. 800 piece available.